For more than a century, St. Charles has been at the heart of the city of Winnipeg. A historic private club, set in a stunning location along the Assiniboine River, St. Charles’ majestic clubhouse, timeless architecture, stately grounds, and award-winning staff will provide you with everything you need to make your special day unforgettable. 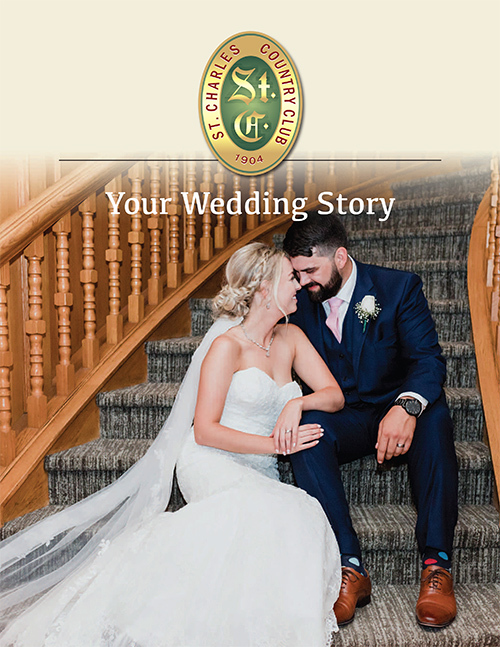 From incredible outdoor ceremonies, to having pictures taken at our classic 27-hole private golf club, your St. Charles story will be without rival and we’ll help you create a wedding you, your family, and your guests will never forget. And no, you don’t have to be a member at St. Charles to host a wedding at the club—but we’ll still treat you like you’ve been part of the club for years. Start your own story with our club. For more information, please contact Food & Beverage Manager Tyler Scammell by phone at 204-889-4444 or email by clicking HERE. Click on our digital wedding brochure above for more information. Photo courtesy of Chopp Photography. Weddings at St. Charles Country Club offer a unique balance of tranquil park like surroundings, extraordinary food and refined service. The Club only books one wedding per day ensuring unsurpassed attention by our catering and culinary team. Click below to see some of the most frequently asked questions that our Food & Beverage Manager, Tyler Scammell, answers on a regular basis.